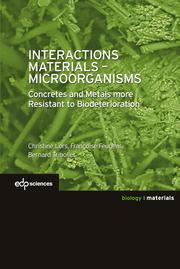 This multidisciplinary book is the result of a collective work synthesizing presentations made by various specialists during the CNRS «BIODEMAT» school, which took place in October 2014 in La Rochelle (France). It is designed for readers of a range of scienti?c specialties (chemistry, biology, physics, etc.) and examines various industrial problems (e.g., water, sewerage and maintaining building materials). Metallic, cementitious, polymeric and composite materials age depending on their service and operational environments. In such cases, the presence of microorganisms can lead to biodeterioration. However, microorganisms can also help protect structures, provided their immense possibilities are mastered and put to good use.
? design and modi?cation of materials. The af?liations of the authors of the various chapters illustrate the synergy between academic research and its transfer to industry. This demonstrates the essential interaction between the various actors in this complex ?eld: analysing, understanding, and responding to the scienti?c issues related to biodeterioration.